What comes to mind when you think of the word “Nordic”? Classic cross-country skiing? Vikings? Snowflake patterns on knit sweaters? Since it was founded in 1979, the Nordic Heritage Museum—now to be known simply as the Nordic Museum—has been working to change that. Why not haute cuisine, award-winning literature, iconic fashion, famous royalty, contemporary art, modern design, sustainable living? After all, the five Nordic countries—Denmark, Finland, Iceland, Norway and Sweden, along with their islands and autonomous regions—have a long, rich history of traditions and innovations worth celebrating. The museum’s new home in Ballard, a stunning, design-centric facility overlooking Salmon Bay, does just that. The 57,000-square-foot building is a giant leap from its former home literally and figuratively; the old museum space, a 1907 brick schoolhouse, is located about a mile south. 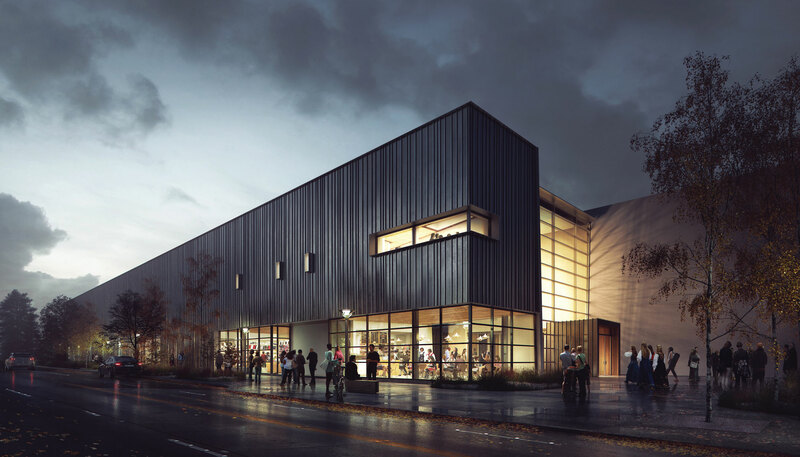 Yet this undertaking was no mere “lateral move”; a decade’s worth of planning, a multimillion-dollar capital campaign and globe-spanning creative collaborations have taken place to bring the project together. This includes a gathering of carefully selected, award-winning partners, such as architects with Seattle’s Mithun firm (who designed the facility), museum exhibition design firm Ralph Appelbaum Associates (the team behind exhibition spaces such as the United States Holocaust Memorial Museum and the National Museum of African American History and Culture, both in Washington, D.C.) and Finnish architect Juhani Pallasmaa, who advised on matters of the Nordic aesthetic. These carefully laid plans are evident as soon as you see the site, nestled at the corner of NW Market Street and 28th Avenue NW. Sleek Danish-made exterior siding encapsulates the asymmetrical Nordic modern structure. A floor-to-ceiling wall of gleaming windows makes up the main entrance on the west; the effect is mirrored on the building’s opposite side, allowing for dramatic play of light off the snow white walls flanking Fjord Hall, the ground-level corridor designed to echo the region’s rugged geography. Other notable exterior features include the meditation garden, to the east, and the sprawling, south-facing outdoor patio (and rentable event space), which leads to a parking lot for 76 cars—truly valuable real estate in the booming neighborhood. Heading inside, wooden door pulls hand-carved by Seattle artist Steve Jensen anchoring the two main entrances incorporate traditional Norse symbols, such as stars, waves and oars. Look up as you move through Fjord Hall; everything is Nordic, from the Louis Poulsen hanging lamps to the hand-blown glass birds from the Faroe Islands, and the room-specific Danish flooring to the Finnish Kone elevators. Overhead, architectural bridges crisscross Fjord Hall, connecting the second-floor galleries housing the museum’s permanent collection, chosen from 77,000 objects and artifacts. The walkways are also metaphors: symbolic crossings that reflect the Nordic peoples’—and cultures’—diaspora throughout the world. The metaphor is particularly relevant for Seattle, whose fish- and forest-rich industries long ago attracted scores of Nordic immigrants, who planted cultural roots in the city, many in the Ballard neighborhood (which celebrates its heritage on Syttende Mai, Norwegian independence day, with a parade and festival on May 17). Could those ancestors have guessed that the city would one day be home to the largest museum in the United States dedicated to honor their legacy and influence? Would they have believed that Architectural Digest, The New York Times and other publications have dubbed it one of the top new museums to visit in the world in 2018? What is known is that the Nordic influence is everywhere, in Seattle and beyond, from pop culture to politics—and the Nordic Museum is the stage to tell the world all about it. NORDLANDIA: From top left: The Grand Staircase leads to the second floor galleries; Fjord Hall (shown during construction), the first floor corridor, mimics the distinctive inlets of the Nordic countries; Grand Hall, the museum’s new state-of-the-art auditorium, features gorgeous hemlock walls and cut fir floors; a 100-year-old Finnish sauna sits in the soon-to-be completed Meditation Garden. Photographs by Alex Crook and Barbie Hull Photography (sauna). Products at the new museum store may include items such as this minimalist salt and pepper shaker set by Thea Mehl, a Marimekko tea towel and handbag, and a print by Klaus Haapaniemi. Taken as a whole, the Nordic Museum is the perfect marriage of old and new. Relics and artifacts from the region’s countries—some thousands of years old—have found a happy hygge home alongside cutting-edge, contemporary Nordic art, design and the museum’s special exhibits. While not yet finished at press time, the museum store has the potential to do the same, marrying items that give a nod to the current Nordic-obsessed design and lifestyle craze with more traditional wares. Operations manager Adam Lee Allan-Spencer hints that it will. “From fashion to home,” he says, “we will focus on simplicity and ‘Nordic living’ trends that we see taking root here in America.” He indicates that shoppers will still find beloved brands such as Royal Copenhagen and timelessly modern items from the likes of Marimekko, but the store will also be a platform to showcase the region’s latest vanguard of artists and designers, such as the minimalist barware and tabletop creations of Norway’s Thea Mehl, and items and housewares carrying the more intricate and traditional graphic artwork of Finnish illustrator Klaus Haapaniemi. Other products will include crafts inspired by the Sami, Scandinavia’s indigenous people, natural beauty products from Iceland, environmentally friendly Danish toys and—thank goodness—Swedish chocolate. He didn’t mention it, but our guess is that you’ll find the latest version of The Little Book of Hygge and The Gentle Art of Swedish Death Cleaning on the shelves, too. Chef Brendan Arntz’s menu of light bites in the museum café includes a few varieties of smørrebrød, Danish open-faced sandwiches topped with ingredients such as asparagus, beet-pickled eggs or juniper smoked salmon. Photo by City Catering. In line with the nordic museum’s strong architectural design, no detail was spared in the planning of its bright, open café, Freya, from its name (shared with the Norse goddess of love and beauty) to its seating (Swedish Lammhults chairs). It is housed in the museum’s sunny northwest corner and offers a rotating menu of smørrebrød, the Danish open-faced sandwiches ($9–$14); meat-and-cheese plates they’re calling smorgasbord ($12–$14); salads ($8–$12); soups ($4–$7.50); and desserts ($2–$4), such as the Swedish ginger cookies pepparkakor. City Catering Company is the culinary creative force behind Freya—which is open not only to museum visitors but also to the public (there are separate entrances for both types of guests)—as well as the bespoke menus for private events hosted at the museum. Many Nordic (and non-Nordic) menu options are offered, including Danish, Swedish and Finnish variations on meatballs. Executive chef Brendan Arntz has spent years following internationally renowned chefs like René Redzepi (of Noma in Denmark) and Magnus Nilsson (of Fäviken in Sweden); you can expect to see their influence, particularly in regard to pickling (such as pickled beets and mustard seeds) and preserving (such as Scandinavian-inspired jams). Café hours: Tuesday–Sunday, 10 a.m.–5 p.m., until 8 p.m. Thursdays (hours may expand later this summer). The restaurant does not open until May 8. See more about the food that will be at the Nordic Museum here. The Sense of Place Gallery on the second floor immerses visitors in a sensory world that explores the geography and climate of the Nordic countries. Image courtesy Nordic Museum. Fjord Hall, the fjord-shaped corridor and first floor of the museum. Freya, the museum’s on-site café, serving casual Nordic cuisine. Great Hall, the museum’s state-of-the-art, multipurpose auditorium to be used for live performances, theater events, lectures and more. Accommodates 300 seated and 600 standing guests. The Museum Store, featuring Nordic-inspired apparel, seasonal merchandise, gifts and more. Two classrooms and a craft room/woodshop for crafting and language classes. The Nordic Orientation Gallery, a showcase of each country’s distinct culture, along with the values and traditions that they share. The Visiting Gallery, for temporary exhibits. The Meditation Garden, a reflective oasis containing the Nordic Spirit, a 19th-century Norwegian fishing vessel; a 100-year-old Finnish sauna; and personally inscribed legacy plaques purchased to honor the memory of a loved one or other individual with a special connection to the museum. Access to the upstairs exhibits via the Grand Staircase, a sweeping, architecturally arresting corridor to the second level, destined to be a popular photo-op backdrop. The museum’s Core Collection is housed within four distinct galleries, which are located in two wings and accessed via architectural bridges above Fjord Hall. Sense of Place Gallery, an immersive experience of the climate, environment and landscape of the Nordic countries. Nordic Region Gallery, an exploration of the history and culture of the region, conducted through significant historical periods. Nordic America Gallery, a geographic-specific look at the Nordic experience in America. Nordic Perspectives Forum, a space that explores the issues of contemporary Nordic life. A recording studio for podcasts and capturing oral histories, and the Cultural Resources Center for researching genealogy and family history. Staff offices, meeting rooms and volunteer lounge; some spaces can be rented to the public. Read more about the Nordic Museum's opening in the May 2018 issue of Seattle magazine, now available on newsstands.